Summer is here, and your thoughts have probably turned to getting out and about with the family to make the most of the longer, warmer days. Our friends at My Family Magazine have some fantastic travel tips for when you go away with the kids this Summer! All families are different, but when it comes down to it there are some basic requirements for a good family trip. If this is your first trip with your children, plan for a slower pace than you might usually attempt. Be realistic about what you can cover with little ones in tow and if you are travelling with a small child, a pram or buggy can be useful even if your child is walking. It will provide a place for them to rest when covering a lot of ground or a makeshift bed when they are worn out. If you are travelling with another family, discuss what each person wants to do before you go and dedicate childcare responsibilities during travel. Establish how much time you would like to spend together and come to an agreement about the way you’ll split the bills and arrange how to share day-to-day responsibilities. Look into supervised childcare, such as kids’ clubs before you go. Find out what activities the children will be involved in, how many children are cared for and whether the children are grouped by age. Be prepared to check it out yourself when you arrive and make sure that all the necessary paperwork including CRB checks are in place. If anything seems amiss, be prepared to cancel your plans and start looking for alternatives. Enjoy the sun safely, whether you’re at home or abroad, use shade, clothing and at least SPF15 sunscreen to protect yourself. Young skin is delicate and very easily damaged by the sun. All children, no matter whether they tan easily or not, should be protected from the sun. Children with fair or red hair, pale eyes or freckles are at most risk. Keep babies under six months out of direct sunlight, especially around midday. 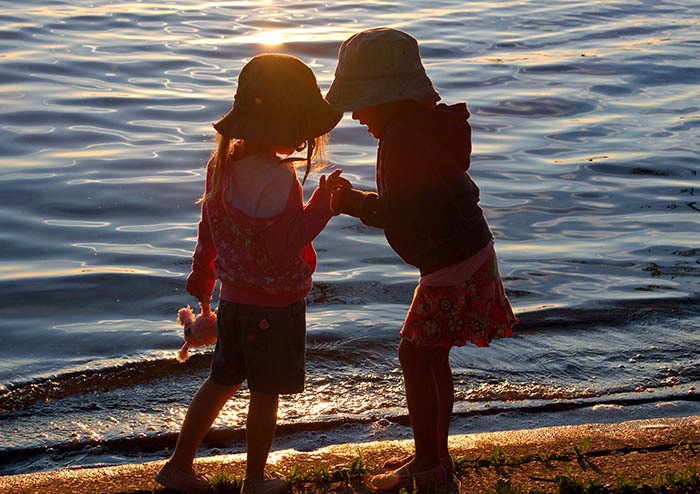 teaching children safe sun habits while they are young sets a good pattern for later life. The Great British sun is quite capable of burning your child! Take extra care at home as well as abroad. Keep babies in complete shade: under trees, umbrellas, canopies or indoors and use pram/ buggy shades. When outdoors, protect a baby’s skin with loose-fitting clothes, and a wide-brimmed hat that shades their face, neck and ears. Buy good quality, wraparound sunglasses for children, as soon as they can wear them. Sunglasses don’t have to be expensive brands. Encourage children to wear hats with brims, especially if they are not wearing sunglasses. The wider the brim, the more skin will be shaded from the sun. Use at least a factor 15 sunscreen and choose a ‘broadspectrum’ brand that protects against UVA rays – the more stars the better. Apply to areas that cannot be protected by clothing, such as the face, ears, feet and backs of hands. Choose sunscreens that are formulated for children and babies’ skin. These products are less likely to contain alcohol or fragrances that might irritate the skin and cause allergic reactions.